Barbecue rub, brown sugar and pineapple chunks are the perfect complement to fresh jalapeños and Carolina Pride bacon and cocktail smokies in this fun appetizer. Preheat oven to 350°F.Starting with a cocktail smokie, top with a chunk of pineapple, then a slice of jalapeño, and wrap in a third of a bacon slice. Secure with a toothpick. When all squealers are assembled, mix dry ingredients in bowl. Toss each squealer in mixture until covered. 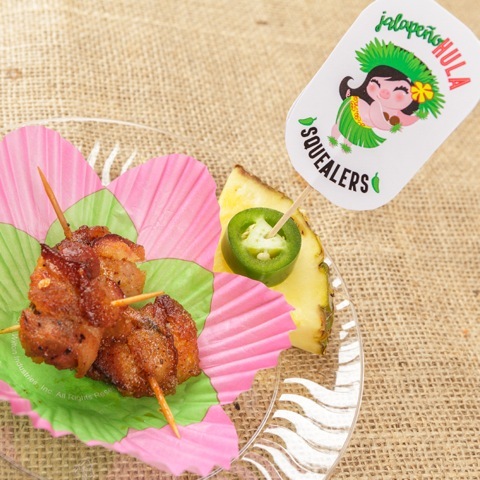 Place each Jalapeño Hula Squealer on broiler pan. Bake for 1 hour; then broil 3 minutes or until brown sugar begins to bubble. Serve hot.